Over the years, the Aston Villa youth academy has produced the odd player that Villa fans can champion as one of their own. European Cup-winner Gary Shaw being the best example of young home-grown talent come good. Since then, it’s been a mixed bag for Villa youth products, exemplified by the differing fortunes of the Moore brothers, but now Villa have perhaps the greatest bunch of academy graduates since Manchester United’s all-conquering crop of the 90’s. The Villa team that conquered Liverpool 3-1 at Anfield had six Aston Villa youth academy graduates starting (Herd, Bannan, Weimann, Clark, Baker, and Lichaj), with Marc Albrighton also on the bench. In recent years, these boys’ winning mentality and success has largely been obtained under the radar, with them being the backbone to Villa’s continued success at youth and reserve level in the past few years. Five of the seven players mentioned above – Albrighton, Herd, Bannan, Lichaj and Weimann – played for Villa when they beat a decent Juventus team (with Buffon and Del Piero amongst others) in the Peace Cup Final in 2009. Add to those five, goalkeeper Brad Guzan and the blue print for Villa’s current success was clearly first written on those team sheets in Spain during that tournament. It may have just been a preseason tournament, but that night against Juve, Villa fan’s greatest joy was the feeling that Randy Lerner’s promise of a ‘bright future’ might have some substance. Albrighton terrorising a top Italian defence, Bannan coolly slotting home his penalty past Gianluigi Buffon in the shoot-out. It all looked very promising indeed. The players progress was slightly stunted though, when Martin O’Neill, who gave them a chance in the tournament in Spain, then was very reluctant to play them in the season that followed. Certainly there were opportunities in games to give the Peace Cup winning youngsters 10 or 15 minutes, here and there to blood them in. But we all know about O’Neill and his reluctance to use substitutes or rotate his team. When the players did start popping up for first team duty under Houlier and McLeish, the likes of Bannan, Albrighton, Clark and Weimann seemed to rise to the occasion despite having a fragmented team around them (the context of these seasons is discussed in more detail here). After the Villa board’s over-spending and O’Neill’s failed Champion’s League charge, Villa in an attempt to balance the books have turned to the academy to facilitate a more thrifty transfer market spend. The exuberance of youth has also been the focus of Lambert’s purchases, bringing in the likes of Benteke, Westwood, Lowton and Bennett. With a Cup semi-final and a growing resilience in the team, those new players have started to blend in nicely with the academy stars. 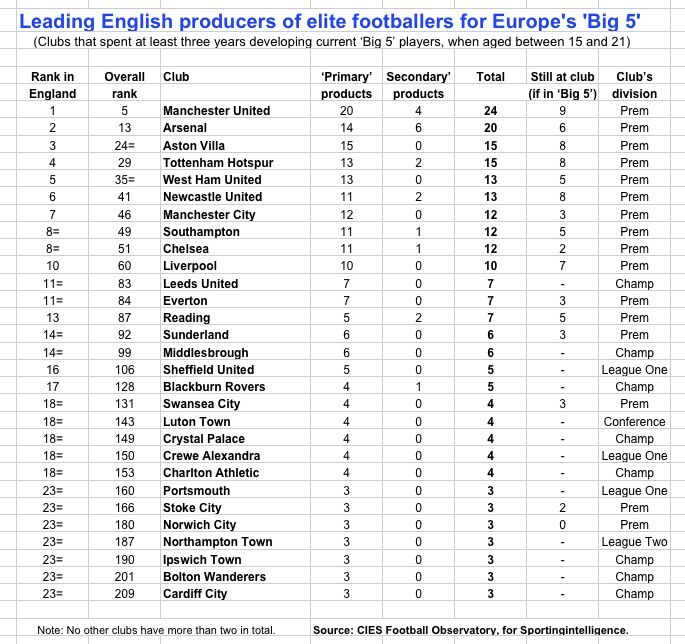 There’s no surprise to find Manchester United and Arsenal top, but with Villa third, it’s heartening to find Villa following hard on the heels of two teams who have clearly benefited from a strong policy of progressive academy player promotion. 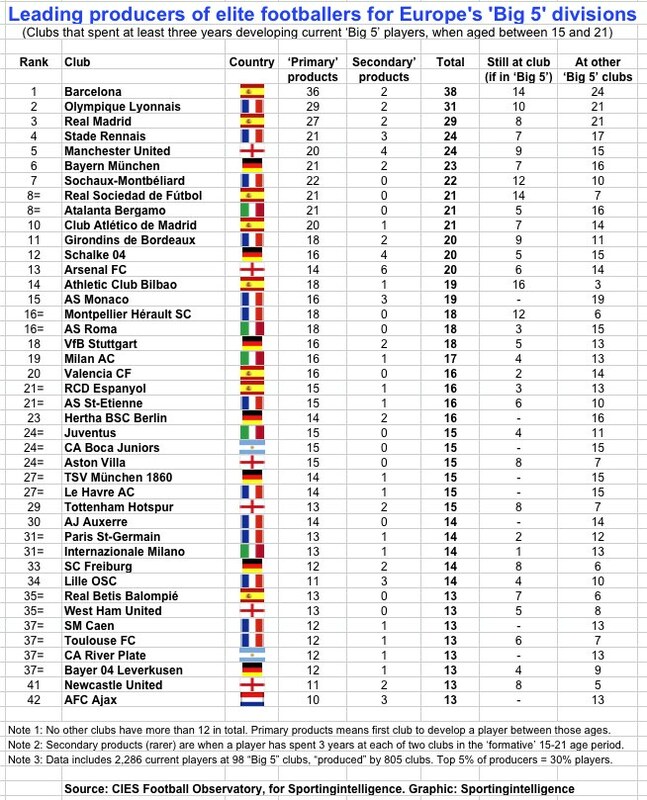 If you want to put that in the context of the whole world, Villa come up 24th in the world when it comes to supplying the five top European league’s elite players. Villa’s success beyond a domestic context has also been demonstrated in the youth team’s recent success in qualifying for the knockout stages in the last couple of years of the NextGen Series competition – a youth Champion’s League, if you will. If you want proof that investing in a club’s Academy bares fruit just look at Barcelona – Lionel Messi, Andres Iniesta and Carles Puyol are all products of their academy, as were the likes of Liverpool’s Pepe Reina and Arsenal’s Mikel Arteta. Another Barcelona product is Chelsea midfielder Oriol Romeu, who was on the bench of last season’s Champions League final triumph for Chelsea. But guess what? Villa’s academy can top that in terms of influencing the winners of the Champions League that night in Munich. After all, Chelsea’s centre back Gary Cahill is one of ours. Cahill is proof that Villa’s new policy of blooding and instilling faith in their academy graduates may bring success that most football fans think you have to spend money for. After all, the top players in football, all have to start somewhere.